I am giddy. Yes, I believe giddy is the word. I am on WINTER BREAK. The first few hours of break. 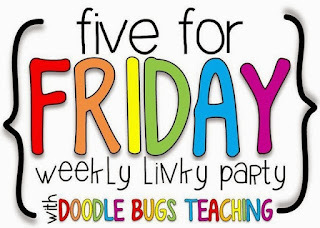 So I thank Kacey over at Doodle Bugs Teaching for Five for Friday as I share five things that make me giddy with gratefulness. 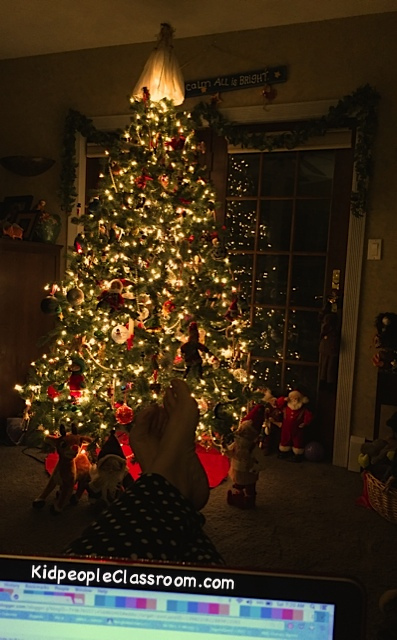 Bloggin' Around the Christmas Tree! 1. We had a MARVELOUS week in my classroom. It was full of magical things every day- like fairies and elves and reindeer... and place value, adding on, and even a couple of running record assessments. We were all giddy. My kidpeople were perfect. Well, not quite. But sorta. Kinda. They really are precious, aren't they?? We peaked in naughtiness on Tuesday. I was peeling them off the ceiling... walls... and floor all. day. long. I was using my grumpy voice and labeling it as such. This was TUESDAY! With three more days to go in the week. As we are line up to go home, a couple of my kidpeople are in the habit of saying, "I'll miss you, Mrs. Wright." It's endearing and it warms my heart everyday, reminding me how truly wonderful kindergarten is. But do you know what I answered when one said that on Tuesday? "Well, I will not miss you. Or you. Or you. Or you, or you, or you... I will not miss any of you tonight." THAT got their attention. THAT is not Mrs. Wright's usual response. What happened to the hugs and high fives? Everyone pulled up short– those in the line, dallying to the line, and still stumbling around in the coat hall. I continued. "This has been a poopy, grumpy day with very little learning. I had to say the same words over and over and over. I will not miss you tonight. I will go home and do a lot of resting and sleeping because this kind of day makes me tired. I want MY kidpeople back. My WELL BEHAVED and DOING THEIR PERSONAL BEST kidpeople. We have a lot to do this week, both learning and fun, and we aren't going to get to do this good stuff if this behavior continues. Can MY kidpeople come back tomorrow and for the rest of the week so we can learn and have fun and not. be. grumpy?" Anyway, on Wednesday, and then on Thursday, and Friday, one of my joyously wonderful kidpeople declared while lining up, "We had a BETTER day!!!!" I agreed and told them how much I would miss them. Truly. 2. I was giddy on my way to school yesterday. I took a cue from Kristen at A Teeny Tiny Teacher as to how she organizes a hot chocolate party. She puts everything the kids need in individual baggies so it's super simple to pass out and clear up– mini-marshmallows, candy cane, and cookie all go in each baggie. I asked PARENTS to make up baggies for us and supply cute cups, napkins, and hot chocolate (known simply as chocolate milk before it is heated). All I had to do was lug my crockpot... I mean, I wouldn't be a teacher on the last day before break if I wasn't lugging SOMEthing. And it worked beautifully. Not perfectly, but beautifully. Here are the tips that will make it perfect next year. One. It takes a LONG time for cold chocolate milk to get hot in the crockpot. I mean even kindergarten hot, which isn't very hot. I put a gallon in my crock pot just before lunch, but after lunch AND music, I still only had luke chocolate (named after lukewarm, not Luke in the Bible). Even kindergartners can handle warmer than luke. It wasn't a problem as we simply watched the movie first then had the party treats after gym. Next year I will put the crockpot on at the start of the day. LOOK at those cookies! Man, they were lovely and delicious. I was impressed. 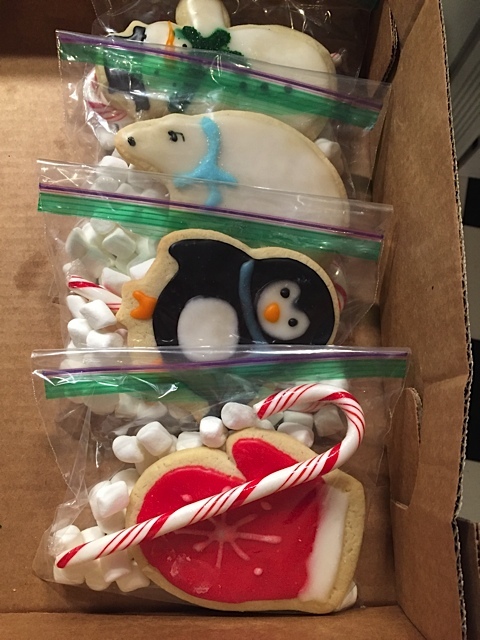 How can a working mom have time to make these cookies? Surely they were store bought. I asked the kiddo who brought them in if his mom baked the cookies and he gave an enthusiastic, 'YES... my mom is a good cookie baker." Dad was quite amused at pick-up time when I told him I was impressed with mom's cookie making abilities... apparently I should be impressed with her cookie purchasing abilities. Those kindergartners are not to be trusted with their stories. 3. I was giddy on my way to school on Friday for another reason- I was in my PAJAMAS! Our last day of school before break is Pajama Day and I LOVE pajama day... and not because it is the last day before break... well, not entirely. (I have been known to host another pajama day for just my class during Seuss week when we read The Sleep Book.) All year long I keep my eye open for pajamas that will be cute at school on pajama day. I love the idea of rolling out of bed, skipping taking a shower then putting my PJs back on. My husband thinks I'm nuts, but he's just jealous... he even said so here on his post. My daughter, home from college, was not giddy as she sat across the table from me at the restaurant last night and said, "Mom, are you wearing your PJs?" Or maybe it was more like, "MOM! You're wearing your PJs!!! In a restaurant!!!!" I ignored her. She, too, has worn her pajamas out in public. She attended the same school I teach at, for pity's sake. Shouldn't make any difference that she was a kid then and I am an adult now. We were in our favorite family-run restaurant and I'm sure there isn't much I can do in the name of teaching that would shock them... I am already known as the Queen of Laminate– half the time I'm there, because I sit and cut the latest laminated project. 4. I was giddy to remember that I don't have to write a parent newsletter next week, but that I will send some favorite eCards through Blue Mountain. The kids love getting them. 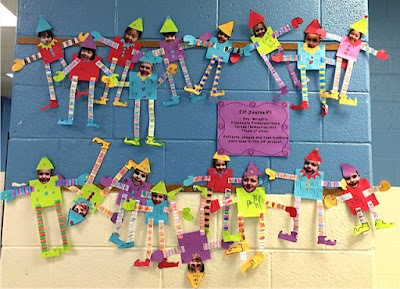 There are a variety of mini-animations and some that you can make talk so you can send an appropriate greeting to all your students no matter what their cultural backgrounds and faiths. I think it is fun to stay in touch with the small fry over this two week break. Click on the pic to check them out. $4 gives you as many as you want for a month, so you can do Happy New Years, too. I don't get any kickback to mention these guys. I just like them and am always looking for ways to connect with my families. 5. 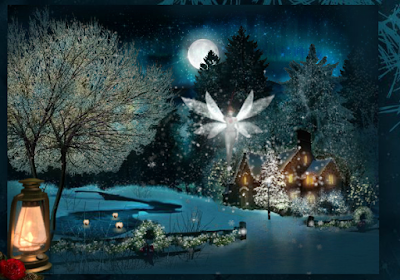 And last, but not least, I am giddy to realize SIXTEEN days of break lie ahead of me, and sixteen days is HALF A MONTH! Doesn't that sound marvelous. Half a month. sigh. Thanks to my friend and colleague who pointed that out to me in an email that I found at three a.m, when I got up, not from worry, or sickness, but from giddiness. I can read my new Downtown Abbey book, or wrap some gifts, or have one of those leftover cookies... wait. I already did that. ANYway, I am up on a Friday night which is usually CRASH night and I can do anything... ANY FUN THING I want to do!!!! Yippee! I love break!!!! I love teaching, but I love breaks more as well. So I sign off now, giddy with thankfulness to be a teacher, a kindergarten teacher with great students, and a great break ahead. Both of my big kids will be home– one from the other side of the state and one from Seattle. It doesn't get better than that. What are you going to do with your time off?? Thanks for stopping by. I'm gonna be posting a bit more in the next sixteen days half a month so I hope you stop by again. Head on back to see what others are up to. You've got time. You're on break. Quick. There's Still Time. Freebie!